This holiday season is all about uniting family and friends, no matter what your religion or whether or not you are religious. It is a time to be inclusive and come together. Simplicity is always timeless and elegant like this organic candle display from Musingsonmomentum. You don´t have to transform or go overboard elaborately decorating your whole home or your entire front lawn to get into the holiday spirit. Don´t overthink it! With these creative ideas and subtle accents, you can set a fabulously festive mood. Go natural – it is part of being authentic. Buy hand-made decor and ornaments made of natural fibers and materials. Artisanal pieces add much more warmth to the overall decor. Go vintage – display something that is of sentimental value to you that perhaps has been passed on in the family (antique candlesticks or vase )…it tells a story. My personal favorites are old wooden toys for the mantle or displayed on a shelf and hand painted glass ornaments. Sentimental touches are crucial. Holiday warm white lights look stunning when wrapped around a mirror, especially at the entry or on windowsill. Use lanterns (add candles and pinecones) with white pillar or votive candles for a more understated atmosphere. Décor doesn´t have to be in the traditional holiday scheme with Santas and Reindeers if that is not your thing. You can create an understated holiday spirit using neutral colors and some contemporary ideas like a fresh tree-trimmings bouquet in a minimalist white vase for your coffee table, creating a beautiful contrast and incorporating fresh holiday fragrance. It´s all about the way you combine things. Natural plants like delicate succulents, poinsettias or mistletoe give that organic touch. When it comes to décor, I always think in layers (like in clothes)…some people need more, some people need less, so it really depends on YOU and how you combine them. Lighting is always effortlessly simple and elegant. 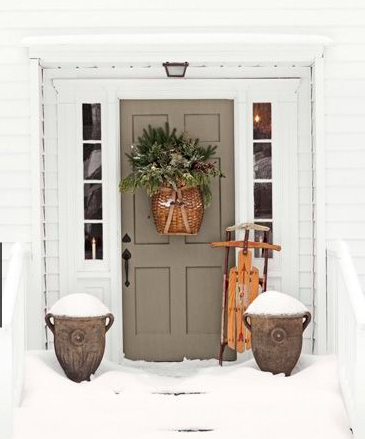 For a minimalist look, a nice accent is to mark the perimeter of your front door with a string of white lights. It illuminates the entrance in a festive way and gives a cozy, inviting feeling for your guests. For a second layer, I love to place two poinsettias, one on each side of the door for balance in Feng Shui. For A third layer, if you are a traditionalist, hanging a holiday wreath is a given. Don´t fill your yard will plastic santas or raindeers…makes it feel artificial. Create a space where you will enjoy entertaining family and friends. Select one area of the house as your focal point for holiday décor and try not to disperse yourself throughout the whole house. Normally, it would be the living room, but if you do formal entertaining in the dining room, you can make that your focal point by decorating a fabulous holiday table. If a Christmas tree is your focal point, be careful not to overdo it with the ornaments. Select a color scheme and stick with it throughout your focal area. Here again, less is more. You don´t have to decorate every piece of furniture. Choose décor and colors that match with the overall design of your house. Color coordination allows for seamless flow of design. This way your holiday décor will complement your home and not disentone or compete in color or design. When colors clash, you have an automatic loss of harmony and create visual chaos. Don´t forget that white is also a holiday color! It is also fun to select decorative pieces and colors in accordance to WHERE you live! You can create a unique theme that goes with country, city, or coastal living. In cooler climates and places like up north or in the Midwest, it is always nice to keep it traditional with green, red, gold and silver. In Miami and the Bahamas, the climate is much warmer so I love using blue, turquoise and silver bulbs on the tree and throughout the décor of the house. 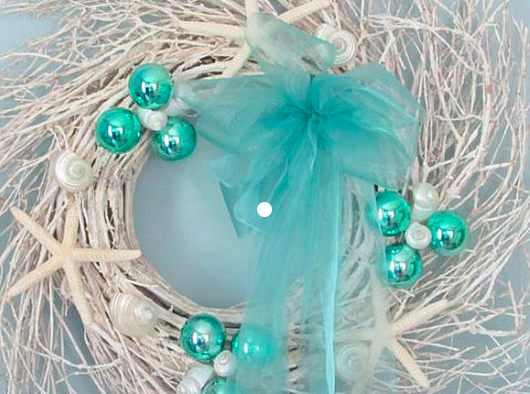 We use blue starfish or pinecones painted in white, giving that coastal touch but keeping with the holiday theme. If you want to keep it really neutral and minimalistic, use clear glass, white, gold or silver throughout the home crating a monochromatic effect. Trends in Table Décor for 2017 are greenery garlands and neutral styling. There is so much to play with so you don´t want to overdo it. China, linens, glassware, table runner, centerpiece candlesticks, napkins, placemats, napkin rings…oh my! Personalize the place settings. It is nice to use decorative place cards for a touch of décor. You can attach them to an ornament ball and you have an instant holiday party keepsake for your guests. 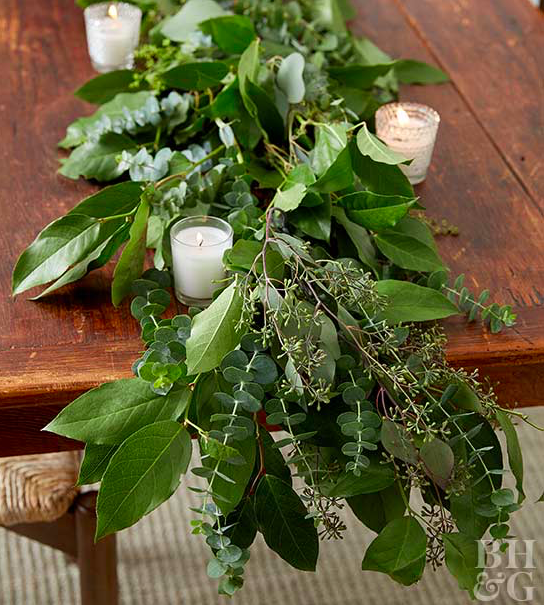 In keeping with the organically authentic theme, incorporate an evergreen centerpiece. Use mistletoe or make one from assorted herbs. I love placing rosemary in small low vases. It looks like a pine tree branch, but brings an element of surprise with a unique scent. 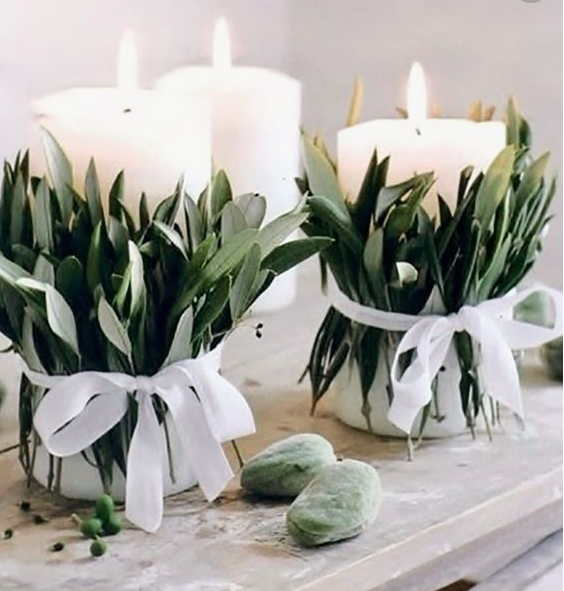 Place a greenery garland and weave through white candles of different sizes for a minimalist look. The second layer would be to add a couple of white snowflake ornaments for a transitional look and adding pinecones is a must if you are traditional. Metallic candlesticks with white (or red) taper candles are so elegant and work with any type of décor in the house. Use linen or cotton napkins with organic napkin rings made with holiday theme like pinecones. Exhibit vintage china or family porcelain. Include an old family recipe for the festivities to keep with tradition. Previous Post Mirror Mirror on the Wall….not always in decor! Next Post Miami Art Basel Week…world-class exhibits, jet-set glamour, and lots of VIP parties! I really like your tips about adding candles and pinecones to lanterns. This would really give off a naturalistic and festive look during the winter. I’ll have to consider your tips so that I can keep the atmosphere of the exterior of my house nice and cozy. Hi Sam! I am happy you found this tip helpful. I love incorporating organic accents into the decor. It makes everything feel more authentic.